dbclunie: "How else do you think they make 5% resistors?" "How else do you think they make 5% resistors?" In an article on Electronics Design, Strategy, News blog titled 7% Solution the author Howard Johnson, PHD explains that manufacturers typically only shoot for a ±10% tolerance on a entire production run of a resistor, and because nothing in life is 100% absolute they have variations in their production. 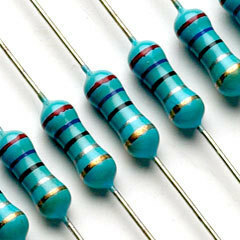 At the end of production when they do their final tests against on they throw away all the resistors that absolutely fail, they then take the resistors that pass at the ±5% or better tolerance, separate them, and sell them at markup as ±5% resistors, and the rest they sell as the lower ±10%. So that's how the ±5% are made, per se. Interesting huh. Just a fyi, its always good practice though to verify a resistor you plan on using with a calibrated multimeter. A 10% carbon-composition resistor is made in a somewhat slipshod manner. The manufacturer tries to get it right, but some of the variables are just too difficult to control. They make up a batch, test them all, and then throw away the bad ones. What's left is a distribution of values truncated on either side at the ±10% limits. The other main feature of the distribution is the big gap-toothed section in the middle. That's where they pulled out all the good parts and sold them at a higher price with a ±5% tolerance. 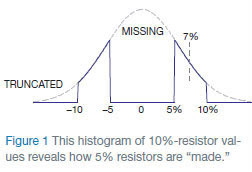 How else do you think they make 5% resistors? I encourage you to go and read the entire article at their website or you can always download the .pdf linked here.